Vuo lets media creators make interactive animations, exhibits, and professional-grade media projects by connecting up simple building blocks. Media creators can use these blocks to manipulate audio input, images, layers, videos, and 2D + 3D graphics, as well as record high-quality video of the results. Vuo 1.2 adds the ability to create custom building blocks, further simplifying workflow. Vuo 1.2 provides quality and speed increases when rendering complex graphics, due to improved graphics performance and reduced CPU usage. 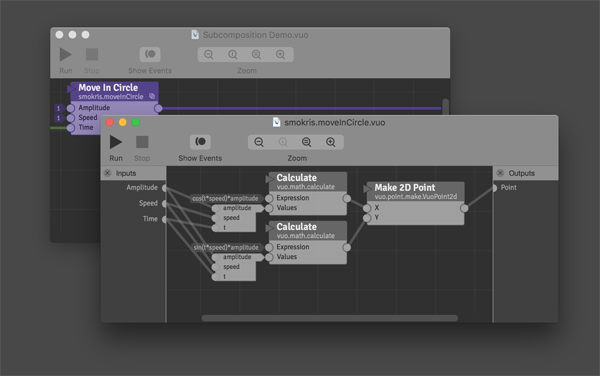 In Vuo 1.2 for Mac OS X, media creators can organize and simplify their compositions by combining Vuo’s building blocks to create larger, custom, reusable building blocks. Vuo costs $49, and Vuo Pro — which includes the fisheye camera and other Pro features — costs $149. Both are available at https://vuo.org/buy. More details are available at vuo.org or in our video (https://vimeo.com/114212032). 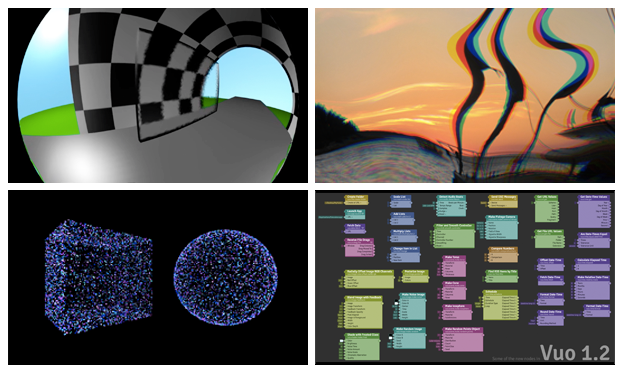 For more images and videos, see our Vuo 1.2 media kits for general audiences, dome and VR media creators, and VJs and visualists. Vuo is developed by Kosada, an owner-operated company that specializes in multimedia and custom software development. Custom development includes applications for Mac, iOS, and Android, and web applications using Drupal. Kosada has long supported the multimedia community through hosting Kineme, a site for Quartz Composer users.